As we wait patiently for the leaves to bud out and the grass to green up, anticipation grows for spring turkey hunting just around the corner! What better way to tide you over in the meantime then to read of two young boys shooting their first turkeys? Let’s go along with 8-year-old Luke Danner and 9-year-old Sherman Hayes as they find success along with their Dads in the turkey woods. 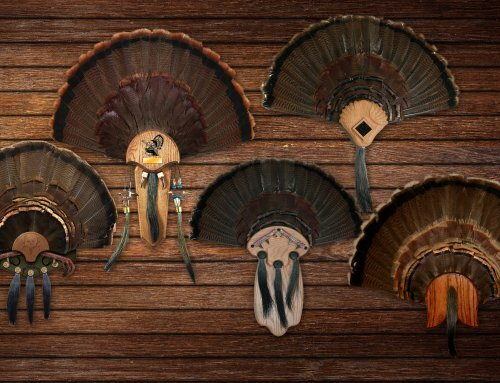 Picture yourself turkey hunting. You’re in a blind and you’ve called in three separate toms only to have a fourth troublemaking, dominant tom chase off all three before they could get to you. After agonizingly watching every single bird disappear time after time over the last couple of hours, now you’ve finally called in that troublemaker a fourth time and you want revenge. This time he’s in range. So close that you can hear his wingtips dragging the ground beside the blind and hear him drumming, which just adds to the anticipation! Only you can’t see him off to the side of your blind. Your mind frantically shifts about what you should do and what is about to happen. Will he escape you yet again or will he make a mistake? Where is he? Will he offer a shot? The suspense is killing you! That would get the heart racing for even an experienced turkey hunter of say 22 years, right? Well that hunter, Jeff Danner knows full well how it feels as he described the encounter to me. You can imagine how excited Jeff was as he hoped and prayed for that bird to make a mistake. Now forget how excited you’d be or how excited Jeff was and try to imagine what it would be like if you were 8 years old! Sitting in that blind right beside Jeff was his son Luke Danner. This was Luke’s first ever turkey hunt. Jeff had taken Luke with him on one other occasion the year before just to get a taste of what turkey hunting was like but this year Luke held a Mossberg 510 Mini 20 gauge that his Dad had gotten him. They had set up their blind days earlier down in Madison County in preparation for Saturday morning’s hunt. Everything was in place. Now Jeff just had to supply the turkeys! Hearing a few birds fly down after first light, Jeff called for a bit and got a response from a gobbler off to the East. “Luke was more in tune to the sounds and things going on because this time, it was his hunt!” Jeff said. The bird would come part of the way but wouldn’t commit and returned to the top of the hill where Jeff knew there was a nice strutting zone. Soon after, another tom gobbled from the West. As time went by, Jeff kept working the call and this second tom finally popped up on their side of the creek across the same pasture they were set up in. 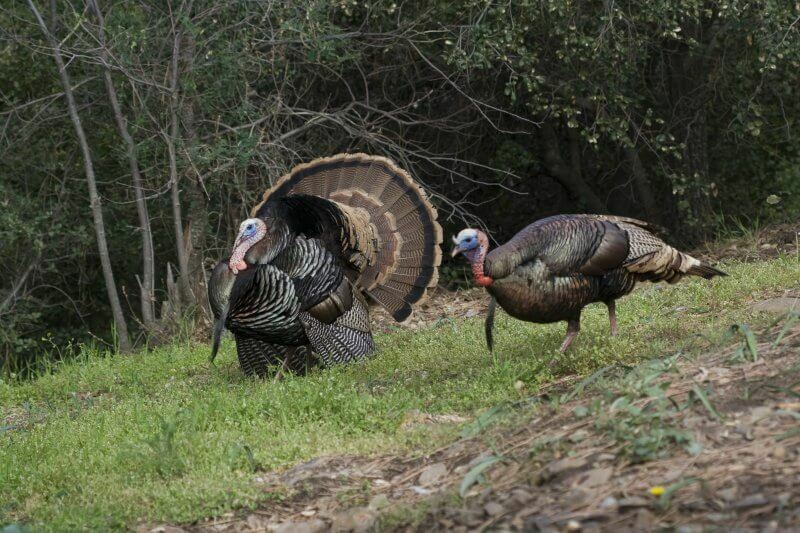 The tom could see their decoys and began strutting. Just then, the turkey from the East gobbled again and in the following minutes began working its way back down to them. Once the strutting tom out in front of them could see this bird, it broke strut and retreated. Upon accomplishing it’s goal, the dominant tom set off back up the hill to his strutting zone. Jeff said, “At that moment I was thinking, this is not good! Luke felt let down with both turkeys having left. It’s hard when you’re 8 years old when things like that happen.” Luke would have to go through it once again a short time later when yet another interested gobbler began approaching from the North. Luke wanted his Dad to shake his tube call to imitate a gobble. Jeff gave it a shake and the gobbler responded right back with a gobble of his own. This time he was closer! Once again however, the same troublemaking tom from the East intervened and chased off this potential victim and then disappeared right back up the same trail. Now Jeff was trying to keep Luke entertained during the boring moments. He had packed Luke’s Nintendo and snacks but they were starting to get old for an impatient youngster. They agreed to sit for a little while longer till 9 am and then leave if they hadn’t saw anything. Knowing time was running out, Jeff began calling very loudly with his slate call. Next, a tom from the Northwest began closing the distance but they heard that same old troublemaker announce his presence once more. This newcomer would tuck tail and move in a direction that would bring it closer. Finally a chance! Luke got his gun up and the bird was at 35 to 40 yards but Dad just wasn’t sure that he’d kill the bird at that range? The bird gets around the blind so that they can’t see it very well and in the meantime Jeff notices something. “I saw that the dominant bird was slowly strutting his way closer to us as well.” They quickly refocused their attention towards the new target and waited! Jeff worked the slate call really quietly as the bird slowly moved in, angling towards one of the sides of the blind. The old gobbler went out of site to the left of the blind but they knew it was still really close. “I could hear his wingtips dragging and we could hear the bird drumming loudly. He was right next to the blind but we couldn’t see him!” Jeff recalled. Dad gave Luke the signal to go ahead and take the gun off safety. They wait and wait some more. Then at eight steps away from the blind opening, the strutter walked by in plain sight. “Luke looked up at me and I just gave him a nod to shoot. It was up to him now!” Jeff said. With a loud boom, the bird that had taken so long and caused so much heartache tipped over right in front of them! “OUCH!” was the first thing Luke said at the feel of the recoil, but Dad was quick to move Luke to a better view of the dead turkey that lay out in front of them saying “You got him! You got him!” The hurt didn’t hurt as bad anymore and they tipped the blind up and went out to grab him. “I’ve never been so excited in my life!” a proud Dad said. Luke had scored a 25-½ pound tom at only eight years old! A feat that he was sure to inform his older sister Olivia of once they returned home. Olivia had killed her first turkey with Dad when she was 9, but being the wise big Sis that she is, she was quick to point out to Luke that her bird was 26 pounds! As an avid hunter, Jake Hayes keeps an eye out for the wildlife that is always abundant around his home. 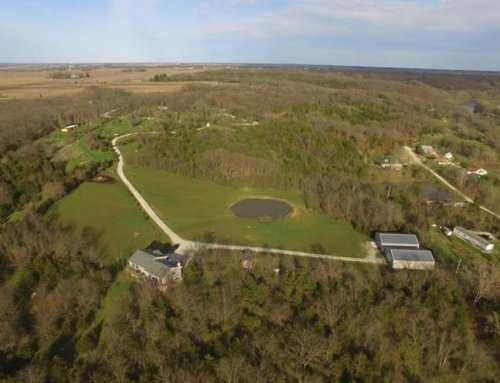 He and his family live in a beautiful spot on their family farm that includes acres and acres of timber and great habitat for turkey, deer and every other critter under the sun. 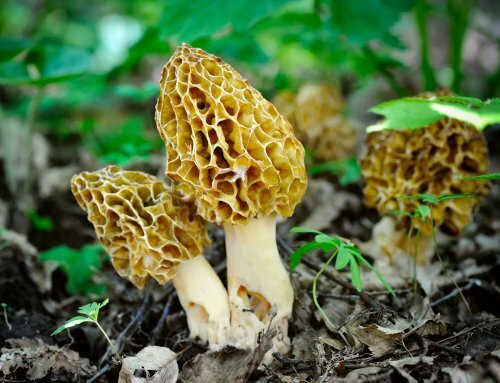 When the hunting seasons roll around, sometimes opportunity will just present itself right there on the farm. Jake was mindful of that since turkey hunting season was upon them and it was time to take his oldest boy Sherman out to try for his first turkey. 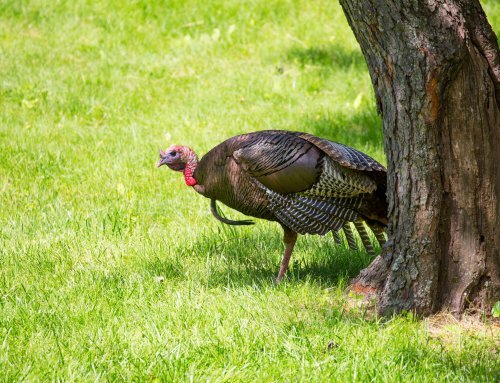 While working around the shop, Jake had been keeping an eye on a spot off in the distance where he had noticed some gobblers hanging out all that week. He could see several turkeys over there that appeared to be strutting and called his son over. “See those turkeys over there? Jake asked his son while pointing to them off in the distance. “Should we get camo’d up and go kill one of them? Sherman excitedly said “Yeah” and off he went to get ready. They worked their way thru the timber towards that spot but before they even got there, they had a turkey gobble close by. They sat down and got ready and Jake worked the bird until it was within range of Sherman’s New England single-shot 20 gauge but there was just too much cover to shoot through and Sherman couldn’t get the shot. Finally the bird moved off. “Let’s keep going,” Jake told his son, knowing that there were plenty of turkeys up ahead that were still sounding off from their strut zone. They carefully made it to a spot where they could see five gobblers still right where they were supposed to be. Relieved that they hadn’t moved off, all was going well with the plan so far. They needed to try and close the distance some more yet and snuck behind a cedar grove to make a final approach. Jake had Sherman crawl farther ahead and set up so that Jake could sit behind him twenty yards and do the calling in effort to pull a gobbler as close as possible to Sherman. It didn’t take long after Jake began calling to have a tom express some interest and head straight for them. The tom was walking towards Sherman with its head up. When it was twenty yards from him, Sherman cut loose with the single shot! “The bird started to run off without really going down. I thought he’d missed him at first, but it ran about 75 yards and then all of a sudden, it started running in left hand circles. Then it went down.” Jake said knowing that Sherman had indeed done some damage. “Go get him!” he yelled to Sherman and Sherman laid his gun down and took off running towards his bird. That’s when Jake witnessed one of the funniest things he’s ever saw while hunting. “As soon as Sherman got to it, the bird hopped up and started running in left hand circles again and Sherman was chasing it in circles trying to catch it.” Jake said, reliving the tale and wishing he had video of the whole scene. Sherman even tackled it trying to get a hold on it so he could wring his neck. Jake hurried over to help and tackled the bird to finally put an end to the excitement! Sherman, being the witty kid that he is, told his Dad after it was over, “It’s about time you came over to help?” They sat down by the fence enjoying a pop and a father/son moment reliving the hunt, just talking for a while after it was over. Jake used the opportunity to instill in Sherman how lucky he is to get to do stuff like this on their farm and how it is important to be thankful for such things. Dad said “I’ll tell you what, I’ll carry the gun and stuff if you’ll carry the bird back to the house.” Sherman agreed and actually made it a long way before finally wearing out with the weight of the heavy bird. 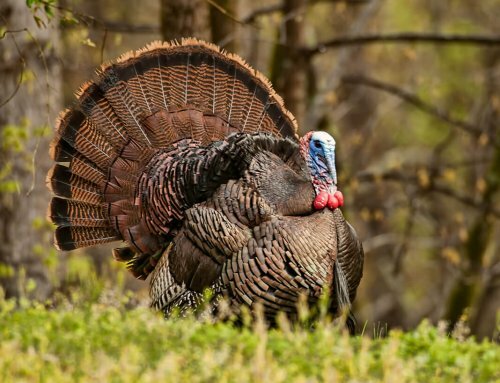 The tom weighed in at 22 pounds, had an 11-inch beard and 1-1/8 inch spurs. Sherman’s involved in youth wrestling quite a bit but this wasn’t quite the wrestling partner that he was used to. Jake said that the bird had been hit in the head probably with one bb, so they were glad that they were able to get him. It wasn’t your typical turkey hunt, but it’s the hunts with special moments like those that’ll make Dad and son never forget it! I think sometimes as adults we often forget where the true joy in hunting really lies. Moments like you read above will have a lasting memory not only on the children that harvested the birds but the adults that made it possible. To this day I can still remember all of my first encounters while hunting and fishing and I have my mentors to thank! I urge everyone that has a child in their life to get them involved, you will soon realize that shooting a turkey, deer, pheasant yourself isn’t as important as giving a child that same opportunity.